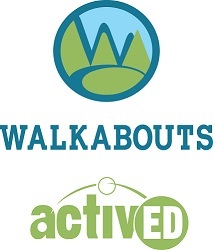 Walkabouts are web-based adventures that transform math, language arts, and reading concepts into movement-rich educational activities for PreK through second grade students. A year-long subscription to the Walkabouts platform includes access to more than 200 lessons, supporting PDF worksheets, and an online assessment tool. Are multisensory lessons that are created online, on demand. A+ Interactive Math Family Packages provide students with a full year of the A+ Interactive complete online curriculum. A+ Family Packages offer parents the ability to access all grade levels for their students - - including the flexibility to move them back and forth from one grade level to the other! Levels in which parents may place their children include K/1-Grade 6, Pre-Algebra, and Algebra 1. A recommended weekly lesson plan covers approximately 30-32 weeks. Students usually cover three lessons per week, and should expect to spend 3-4 hours each week completing the material. If preferred, three-month and full-year subscriptions to a specific grade are also available. Monarch—a fantastic, media-rich online curriculum brought to you by Alpha Omega—is available at Christianbook.com/homeschool! Monarch Complete Subject Sets provide an interactive, biblically-based curriculum for the core subjects of Bible, History and Geography, Language Arts, Mathematics, and Science. With nine topics within each subject, Monarch gives every student a sound foundation! Visit the "Learn about Monarch" page for more information. 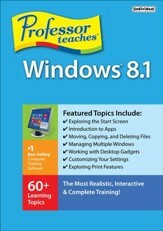 Improve your typing skills with the online courses Typing Instructor for Kids (Platinum 5-Windows), Typing Instructor (Platinum-Windows), or Disney: Mickey's Typing Adventure (Windows), and your OS-skills with Professor Teaches Windows 8.1. SOLARO provides age appropriate, curriculum-aligned educational content consisting of lessons, activities, practice exercises, quizzes, and detailed solutions. Content, in the form of text, graphics, or multimedia (including audio, video, and animation), is available 24 hours a day in a well-organized, searchable, and highly engaging system. 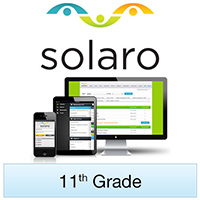 SOLARO is designed to respond to the needs of students, parents, and teachers; this SOLARO at Home membership provides both parents and students with access to all of SOLARO’s services. Veritas Press now offers "Grammar School Self-Paced History" and "Self-Paced Omnibus" online courses that give homeschoolers access to courses ANY time, ANY place, and at ANY pace! Self-Paced History courses cover 32 important historical events over the course of 160 class periods (5 lessons per event, each taking approximately 30-50 minutes). This dynamic curriculum features interactive teaching, including clever games, engaging video footage, tests, worksheets, reviews, songs, and other course content, all of which is graded by the course automatically. Self-Paced Omnibus leads the student through the study of the great works, with an emphasis on ideas, not simply information. Through interactive exercises, games, expert interviews, dialectic questions/exercises, quizzes, tests, and reading assignments, students will gain mastery of facts as well as deep understanding of broader concepts while studying many of the Great Books.